Happy Friday, everyone! I hope you are all looking forward to a great weekend. I will be busy at my sister’s baby shower tomorrow (yay!!!) and hopefully enjoying some Cinco de Mayo festivities on Sunday….! 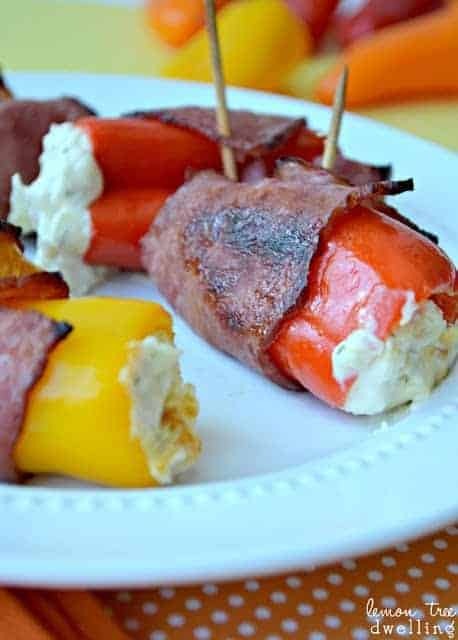 Speaking of Cinco de Mayo, I have had so much fun sharing some recipes with you this week, and I am back today with one more (not so spicy) one: Sweet Mini Pepper Poppers! The full post and recipe can be found over at Or So She Says….but I can definitely tell you these are the perfect Cinco de Mayo recipe for anyone who is looking for lots of flavor without lots of heat. I hope you will come on over and check it out! I love those little peppers Cathy! Can’t wait to check out this recipe! I will definetely be checking those out! They look mouth watering!